If you are confident and take pride in yourself there is a pretty good chance that someone will call you conceited. 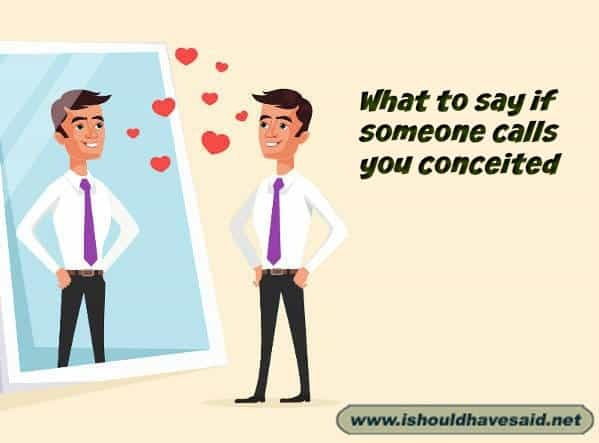 The person who said it to you is probably confusing conceited with self-confident. Folks who care about their appearance can be criticized and called conceited and vain. How you dress and present yourself can make a huge difference in your career trajectory. Employees who take pride in their appearance and grooming actually earn more money than their slovenly coworkers. In roles like CEO, public relations and flight attendant presenting well is actually part of the job description. Next time a disheveled person with a lack of confidence calls you conceited, use one of our great comebacks and don’t worry about their opinion. I mean damn, what's not to adore? People who are as witty, intelligent and as attractive as I am are usually conceited. Conceited, I don't think so. I like to think of it as actually caring what I look like. Got any comments, questions or tips for dealing for dealing with someone who calls you conceited? Share them in the comments below. I’m not conceited, just convinced! I’m a work of art baby. Appreciate or close your eyes. What should I say when someone says you need makeup?